Sometimes you want the best of both worlds; you want a small easily tote-able case and all the graphics power of a good gaming caliber rig. 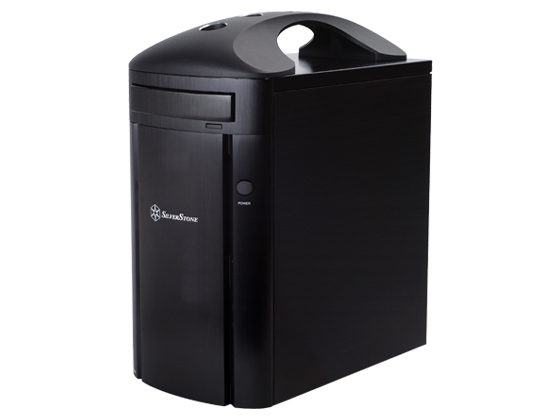 I give you the SilverStone SG04, a case that promises to have both small form factor size and the ability to have dual graphics cards. The slight modification I was lucky enough to receive to review was the SG04B-H which will also get a steel handle and a black paint job. Join me while we go over this Small form factor case, I give you the Silverstone SG04B-H.
That is the quote from Silverstone’s site not Techwarelabs. I agree powerful is not a quality of a case. How can a case be “powerfull”. What does that mean? Is the case ………..I don’t even know what question to ask. This is so patently ridiculous that it defies logic. Here is a computer case, thats all. Looks like a small to medium case and not outstanding in the least. Powerfull indeed! !